My Joyful Moments: My Daughter is a Stamp Designer! My Daughter is a Stamp Designer! The set she designed is called So Deer. She loves drawing little animals. Those are her favorite! 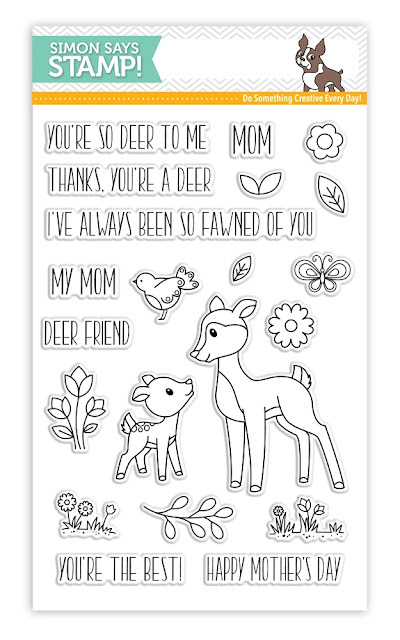 So Deer has sentiments that work for Mother's Day along with many others, which make it a cute versatile set for lots of different occasions. I don't have it yet, or I would have made a card to share with you, but you can bet it's going in my cart today! Thanks so much for stopping by and indulging me for a bit here! I'm so proud and happy for her! She's totally over the moon excited too! You can find So Deer HERE. The whole Simon Says Stamps Mothers Fathers Florals Release can be found HERE. Congratulations Kay...but..just a question...how old is your daughter??? You are soooo Young and she already designd stamps???? WOW! That is so great. I've been thinking of taking an illustrator class at my local tech school. Kids pick stuff up so much faster, and what a great way to use her talents! you should be proud and do all the bragging you want - this is a great accomplishment for a teenager!! Congrats to you and your daughter. Talent definitely runs in your family. Congrats to your daughter and to you! !Wonderful news!! Cheering and applauding the revelation that your daughter is a stamp designer and oh, how delightfully charming it is! So impressive! I can just imagine how proud the two of you are in this resounding accomplishment! Me? I'm WOWed and in awe! Congratulations!! As for 'bragging'...nope, you're just expressing your joy in her talents being recognized! Congratulations! Talent obviously runs in your family! This is an adorable set, and she did a wonderful job with it. Congratulations to both of you! She is oh so talented! Love these deer—they are adorable! With two grown daughters, I know how you must feel as a mother. Again, my congratulations... I will be ordering this set very soon! Oh, my goodness!! Huge congrats to your daughter for designing the adorable stamp set! You must be so proud, how fun!! I love the deer! And, you are right about being able to use this set for many occasions! Looks like I'm going to do some shopping today! So cool, Kay, congrats to your talented daughter! Congratulations to you and your daughter. What a fun as well as adorable stamp set! Wow that is amazing! You should be proud...your talent has rubbed off on her in a marvelous way! Tell Kaylea that her set is simply wonderful and she should continue to hone this talent! How amazing to share a love of cardmaking/crafting with your daughter, and how proud you must be of her. Kaylea's stamp set looks amazing and will surely be the first of many more to come - congrats to her! She is very talented and obviously gets it from her fabulous mother. And you should be very proud - such a cool thing. Go right ahead and brag mama!! This is an adorable set. I'm so happy for Kaylea, she's done a wonderful job on her first stamp set. Please give her my congratulations!! Kaylea's has done a wonderful job designing her first stamp set. I would like to purchase to support her. If I order it thru your blog will she receive a portion of the purchase. Thanks and tell her to keep on designing. Beautiful set, Kay, and I can feel your pride in your daughter! She obviously takes after a very talented mom! Congrats to you both! You should brag!!! This stamp set is adorable!!! Whooo hoooo! Couldn't resist sharing my joy for Kaylea once again! I'm so thrilled for her and for you as her proud mama! Congratulations!! :) Big hugs!! The apple doesn't fall far from the tree...CONGRATS to your daughter on her achievement, Kay! This is such a darling stamp set, and it's going straight on to my wishlist!!! Of course you should be proud! ... and so should she. Good for her! Dearest Kay, I am overjoyed for you & Kaylea. ( I love her name). Dreams really do come true don't they? Will you please pass on my Mega Best Wishes and Congratulations for a continued bright future. (Thx Kay). Kaylea is a talented artist and it couldn't happen to a sweeter mom and mentor! What a wonderful week!! This is so exciting for you both Kay! Congratulations to you and Kaylea , what a darling stamp set! How exciting!! These stamps are fantastic. Congratulations to Kaylea!! I think it is so cool that you both share a passion together! !